RBTH introduces apps for modern gadgets and devices that may be indispensable for foreigners who visit Russia. You can’t have a trip without actually planning it, buying a ticket and finding a place to stay, right? These two apps help you do just that. Avia Sales is in Russian. But the interface is very intuitive and if you do need to purchase domestic flight (let’s say you are heading to Irkutsk , near the lake Baikal ) this app searches for the best deals on Russian travel websites and allows you to book and buy a ticket using your credit card. Kayak is an app foreign travelers are familiar with and an alternative to AviaSales. Kayak includes flight and hotel search and booking, Flight tracker and My Trips, which allow you to store all the information about your trip in one place. However I don’t guarantee you will find the best deal using this app. 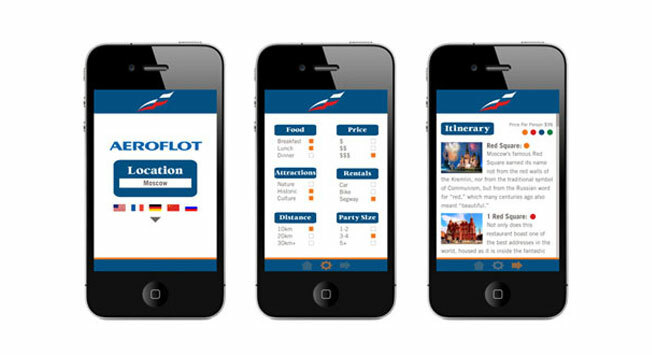 This app allows you to store all your itineraries, track flight status and updates and share info via email. There are some free alternatives that have similar functionality but I found this one to be the most accurate. Each of these three apps has its pros and cons. Google maps is very accurate app which builds routs and gives directions for driving, walking and using public transportation. Yandex.Maps does the same plus it shows you traffic level rated from 1 to 10 points. If the traffic level is at five right now it is better to use public transportation if you need to be somewhere on time. Yandex has a great feature, Search button and a menu of nearby Bars, Restaurants, Fast Food, Gas Stations, Drugs Stores, etc. The app gives you basic information about the location plus directions on how to get there. Apple Maps is great if you are looking for walking directions, or using public transportation directions, or driving directions with turn-by-turn navigation. When you choose a public transportation option Apple Maps connects you to the routing apps, including Yandex.Maps and Google.Maps. Walking directions I found to be the best with the Apple app. As for the turn-by-turn navigation, it works fine except Siri has troubles pronouncing Russian street names, not to mention that most street signs in Moscow are written in Cyrillic. A must have app similar to HopStop. It builds the most convenient metro route based either on your current location or the station name you type in. The only disappointment is a Cyrillic – written station names. Yandex.Taxi and Get.Taxi are two very similar apps that allow you to order a taxi based on your current location or address. You can use the option “Get taxi now” or indicate a specific time. You can choose the best tariffs (economy, comfort or business) and even mark that you’d rather get a ride with a non – smoking driver. Depending on a taxi company that picks up your order, you can pay cash or using a Visa/ Master card. Wheely is the app for a Business traveler. It promises “a private driver” type of service and I can assure you Wheely delivers just that. The driver will arrive in a short amount of time on a business class type of car. You can make a reservation for later. Most drivers are non-smokers, they wear business suits, cars are clean and nice. You connect your credit card to the app, and it will be charged immediately after the trip. You get a receipt by email. I did not find any Russian dictionary apps I would be fully satisfied with. This one is convenient; it translates words and phrases and reads them for you. It gets tricky if you need to translate some complex sentences. The app has “Read phonetically” option available with 3 month ($1.99) and a year – long ($4.99) subscription. The app does not work offline, which is pretty inconvenient. Both of these apps have similar information and functionality – basic useful information on getting around, offline maps and schedules, weather, currency, business directory, concerts and theater, hotels and restaurants, sightseeing, shopping, embassies. “In your pocket” app has a “Search Venues” feature which I recommend. When you type in your location, the app gives you the list of what’s on in Moscow tonight. “Expat life in Moscow” chapter is also neat if you plan to stay in Russia longer. “Time Out Moscow” app will automatically pick up your default language for the interface, but the content is in Russian only. The app has options of suggestions based on your location, “Inspire me” feature (a random choice of a activity for the evening), Top - 10, Favorites. The good thing about this app is it redirects you to the Apple Maps to show where the venue you chose is. It does not allow you to create directions of how to get there. That’s a bad thing. This app is not nearly as useful as Yelp (which unfortunately does not work in Russia, and Russian copy – cats I would not recommend yet), it does not provide you with the real customer reviews but it shows you location photos. Which is why it’s worth having it on your phone anyway. Moscow is so truly beautiful. You would want to share the pics you’ve taken. Here comes handy the famed Instagram app or less famed but yet beautiful and convenient Flickr app. Tired? Not in the mood to go out for dinner? Tell me about that. I found an app with food delivery service. The app is in Russian only however the interface is very intuitive. A choice of Japanese and European menus, pizza, kids menu, deserts and drinks are available to order. Delivery is free and you get a 10% discount on your order. You can either pay cash upon delivery or you can connect your card to the app and you will be charged in full amount as soon as the order is places. The minimum price of order for delivery is 790 rubles ($25). Available on iPad only, this app is the best English – language app for what's going on in Russia. Photo and video galleries might give you an idea of what places you want to visit and what memories you want to bring back home from your trip. Interactive Map of Russia will inspire you to come back and explore the rest of the country. Which are your favorite apps you found to be useful while travel to Russia?